Skoda Kodiaq Laurin & Klement has been launched just in time for the Diwali 2018 festive season. Skoda Auto India today introduced the new Kodiaq Laurin & Klement at an introductory ex-showroom launch price of Rs 35.99 lakhs. Furthering the company’s SUV offerings, Kodiaq laurin & Klement brings in a new flavour. Available in five colour options – Lava Blue, Quartz Grey, Moon White, Magic Black, and the all-new Magnetic Brown, the new variant embodies a personal touch in all aspects, an ode to the company’s founding fathers. New Skoda Kodiaq Laurin & Klement gets power from a 2.0 TDI (4×4, AT) diesel engine that returns max power of 110 kW (150 PS) and maz torque of 340 Nm. The AWD with electronic control offers improved traction, stability, and safety. The electronically controlled multi-plate clutch makes off-roading fun. The control unit figures ideal driving torque for the rear axle in real time. Loss of traction is avoided as the control system is dependent on driving status. When cruising, power is transmitted to the front axle for improved fuel efficiency. Kodiaq Laurin & Klement variant’s front fascia features a distinctive chrome grille, LED headlights with illuminated ‘eyelashes’, and 18(R) Trinity alloy wheels. At the rear, crystalline elements feature in the C-shape LED taillights. A chrome trim in the rear bumper borders the exhaust pipes, and diffuser. Silver roof rails are included. The Laurin & Klement signature badging sits on the front wings. Style accents include piano black lacquer finish detailing matched with chrome bits. 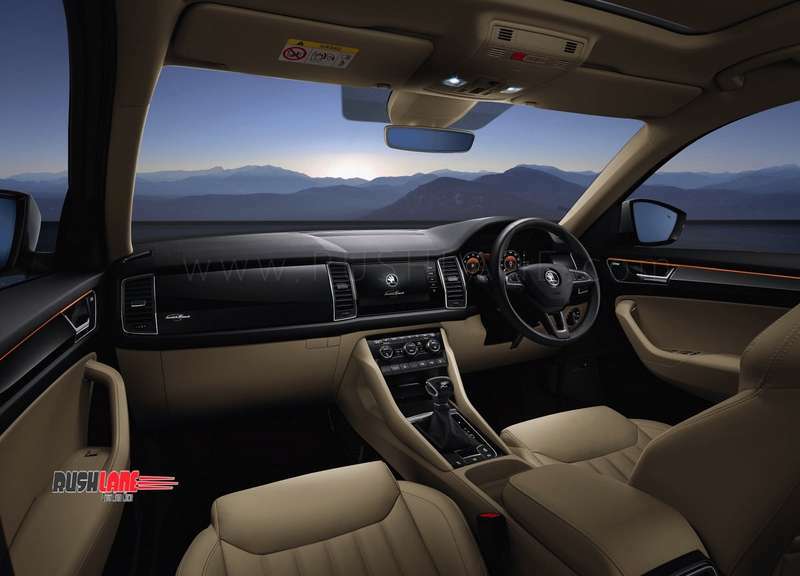 The logo is also seen in the stone beige leather upholstery, and infotainment system home screen. The info system displays footage via a 360° Surround Area View with four wide-angle cameras mounted on the front and rear, and wing mirror covers that covers the area surrounding the car. Hands-free parking does what it’s meant to, and give a space 60 cm longer than the car, parallel parking becomes a reality. Technical inputs include a virtual cockpit that brings together important driving data and navigation. Customizing and control is possible through the view button in the multifunctional steering wheel. An 8″ capacitive touch display responds to finger touch, and is part of the new gen Skoda developed Amundsen infotainment system. SmartLink+ bringds together SmartGate, Apple CarPlay, Android Auto, and MirrorLink. The Canton Sound system features 10 speakers, a subwoofer, and has a power output of 575 watts. 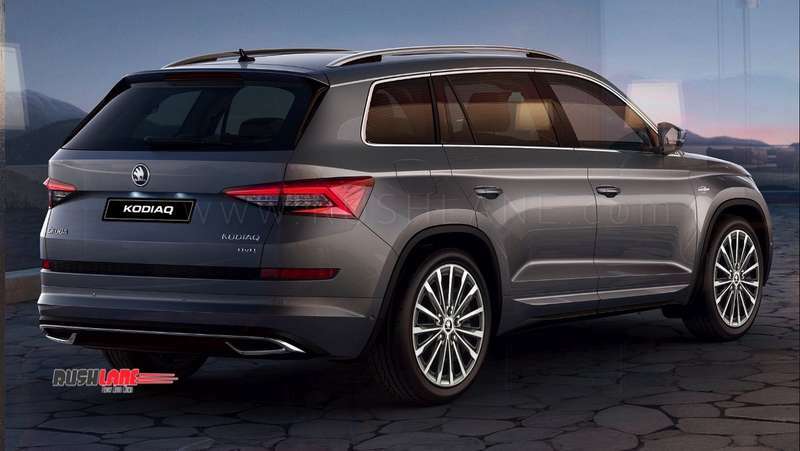 Skoda Kodiaq rivals Toyota Fortuner.